We have now introduced junior development squads (11, 9 and 7 & under) for the more advanced young kids to enhance their tactical & technical game and prepare them for modified tennis competition, such as Hot Shots events and junior club pennant competition. These squads focus on the basics of gameplay and use the modified equipment & court areas to make learning faster! Development squads are for the 11 & over player that is able to rally and looking to get ready for some competition. These squads focus on more advanced aspects of the games such as court positioning, shot selection, spins and match tactics as well as consolidating technique. The final ½ hr of each session is set aside for match play, so you’ll be ruling the court in no time! 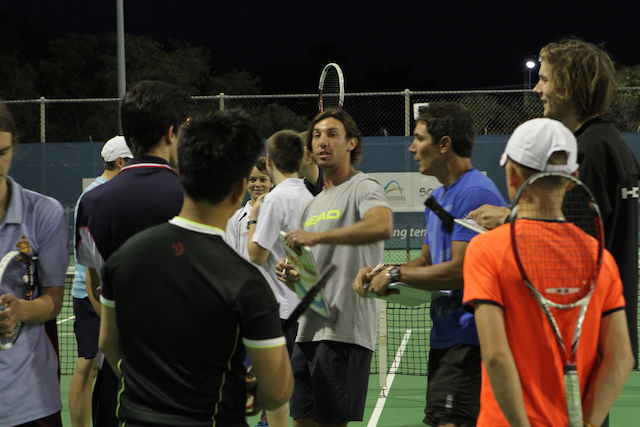 Elite squads are for those who are serious about their tennis and involve cutting edge, intense training. Players are set attainable goals and work through advanced aspects of tennis, fine-tuning their game style and learning to be a tough competitor. Elite squad members are usually taken through invitation, as a minimum standard is required. Most kids enter through the development squad system, however we’ll take anyone if they’re good enough and prepared to work hard!